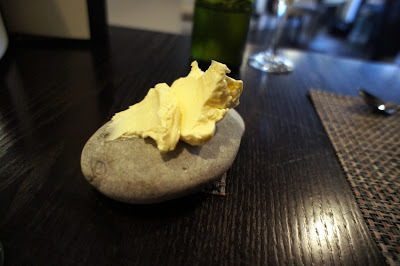 Having been asked by Toptable a couple of weeks ago to come up with a Top 5 restaurants of 2011 (and somehow managing to pick not a single one bookable on Toptable...oops), I thought the job of picking an overall winner for the blog would be easier. In fact, it's been a bloody nightmare. 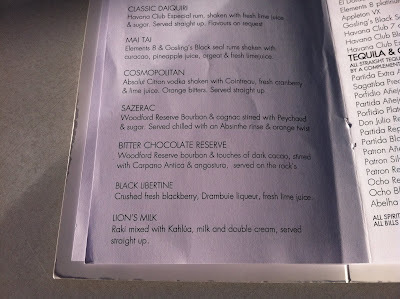 For some reason, my favourite restaurants of previous years have, in their own ways, been shoo-ins - obviously Tayyabs had to win at least once, Rules another, and there will always be a special place in my heart for the astonishing Ledbury. But this year it sometimes felt like all my food wishes had been granted at once - each month brought yet another exciting new opening or dangerously obsession-forming discovery and keeping up with it all was as exhausting as it was thrilling. It's a strange phenomenon that in an economic climate that you'd expect to limit the scale and ambition of London's restaurants, the opposite seems to have been the case. Russell Norman's restaurants (including my personal favourite Spuntino, above) are often spoken about as "recession-busting", thanks to their focus on informality and tasty comfort food served at reasonable prices, but actually the top end - "fine dining" for want of a better phrase, and believe me I do want - has seen just as much activity. People don't mind splashing out occasionally if - and only if - they feel they are getting their money's worth; this is why it's near impossible to get a table at Goodman of an evening but fusty old temples of silver service like the Rib Room are suddenly feeling rather anachronistic. Customers are fussier when times are hard, but the best places realise that and not only meet their expectations but regularly exceed them. So, yes, settling on an overall winner has been nearly impossible. The temptation to cop-out and declare a joint or shared 'best' is huge, but in the end that would be a cop-out, so I've had to be brutal and pick just one. It would have been satisfyingly topical to choose a restaurant formed in the fires of London's street food scene but MeatLiquor, dive bar, burger joint and den of iniquity, only missed out by a whisker. Deservedly rammed from the moment it opened, this is the kind of restaurant I'd open if I ever could - fast food as recreated by people who understand everything that's good about it and are obsessive about every detail. 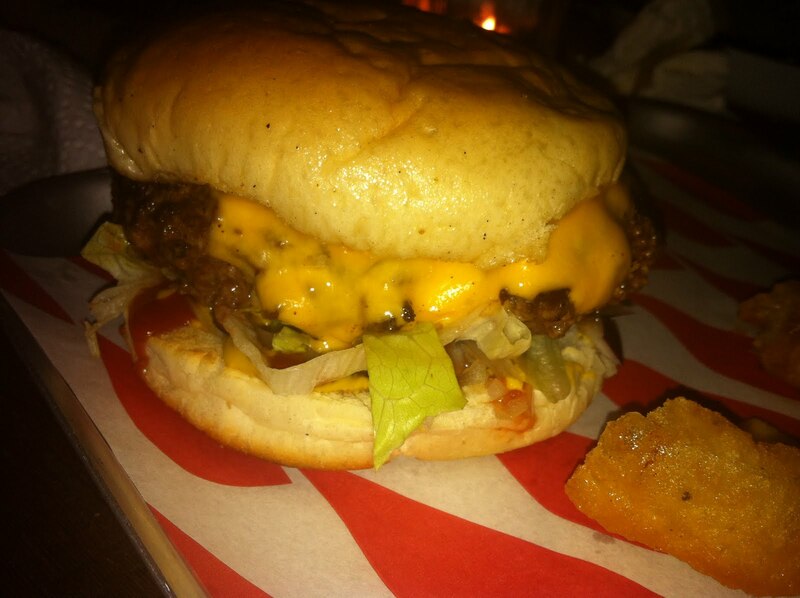 Despite some fierce new competition, there still is no greater burger in London than MeatLiquor's (I'd go for the bacon cheese pictured below if it's your first, but they're all great), and the buffalo wings and chilli cheese fries are as addictive as they are messy - which is very. Special mention too should go to the guys at Soulshakers who match the food with inventive and very reasonably priced drinks. Once inside - and at busy times, that takes a while - you simply will enjoy yourself. It is always worth the wait. I've rambled on long enough even without mentioning gems like José (below), Zucca, Silk Road, Bob Bob Ricard, Dinner, Soif, The Heron, Amici Miei, Magdalen and God knows how many other fantastic restaurants in this extraordinarily diverse city so I had better stop while I still hopefully have your attention. Thanks, as ever, for reading yet another year's worth of rants, misinformed opinion and hyperbole; I'm sure there'll be plenty more where that came from in 2012. Meantime, have a very happy Christmas and New Year, and I only hope you're looking forward to the next twelve months as much as I am. 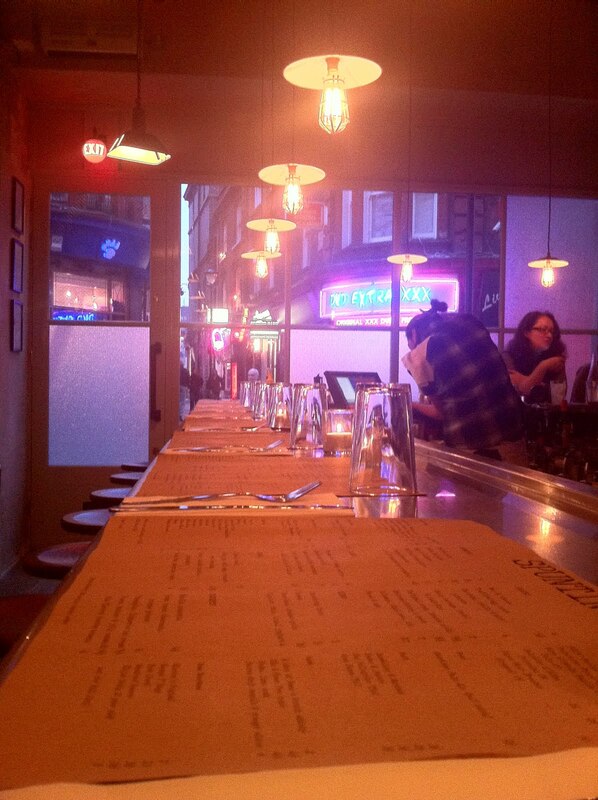 And if you're not yet, then how about this - Pitt Cue are opening in Soho in the first week of January. You're welcome. It is a common complaint levelled at overeager food saddos like me that we will often review restaurants in their opening days and weeks before they've had a chance to "bed in". By and large, this accusation is easy to deflect - if anywhere is open and unapologetically charging full price, they deserve a proper critique. If they're not - a soft opening or press launch - then that's different of course, and I very rarely write those up in full (though on this subject, do go to Burger & Lobster, it's brilliant). However, nobody can accuse this blog of being too early to the party regarding Lucky Chip - they've been operating in one form or another since March and given the reams of positive feedback from others, I have no idea what's taken me so long. If they've not "bedded-in" by now, they never will. So, on a freezing cold Saturday afternoon, in a spot well away from the overpriced olive oil vendors and irritatingly kooky buskers of Broadway Market itself (no, wailing Babooshka by Kate Bush along to a backing track doesn't make you part of an exciting counter-culture, it makes you a moron) we queued up to place orders at the Lucky Chip van. 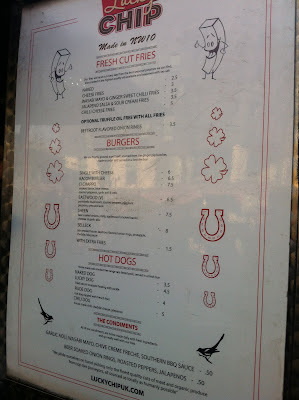 I wish I could report on more of the menu than the bacon cheeseburger and fries but as this was all either of us wanted, that's all we ordered, although the idea of scoffing down one of their oak-smoked hot dogs did fleetingly cross my mind. Maybe next time. For I'm sure there will be a next time. 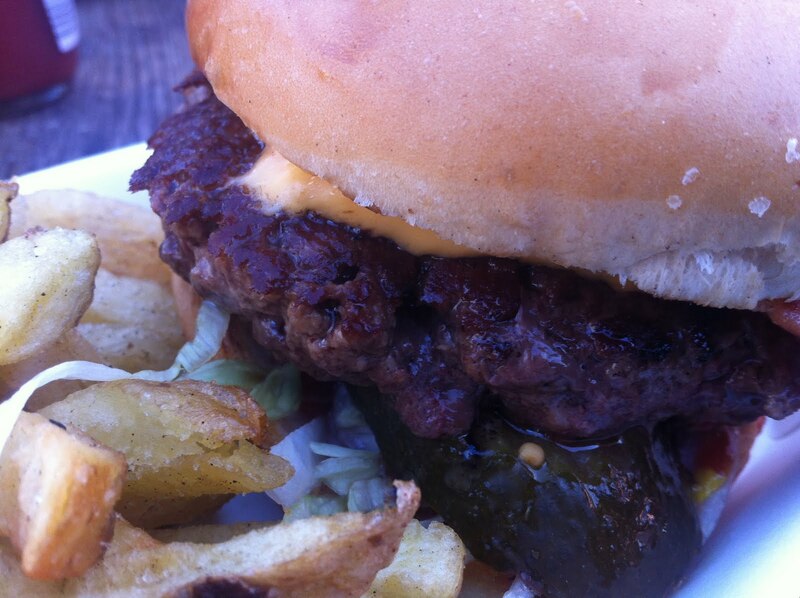 A couple of niggles aside, this is a top burger. Inside a firm, glossy brioche bun (don't let anyone tell you that brioche buns have to fall apart like sponge cake - Lucky Chip have nailed it) was a good amount of medium-rare aged beef (the menu said Ginger Pig but I'm reliably informed they have recently switched suppliers to Walter Rose) soaked in bright yellow American cheese (hooray!). Adding much-needed crunch (the beef itself tasted great but was missing that MeatLiquor char) and all-important sour tang were some excellent sliced pickles and a subtle application, on the bottom bun, of Heinz ketchup and French's mustard. Shredded lettuce added a bit of volume. So far, then, so very very good. But why back bacon? 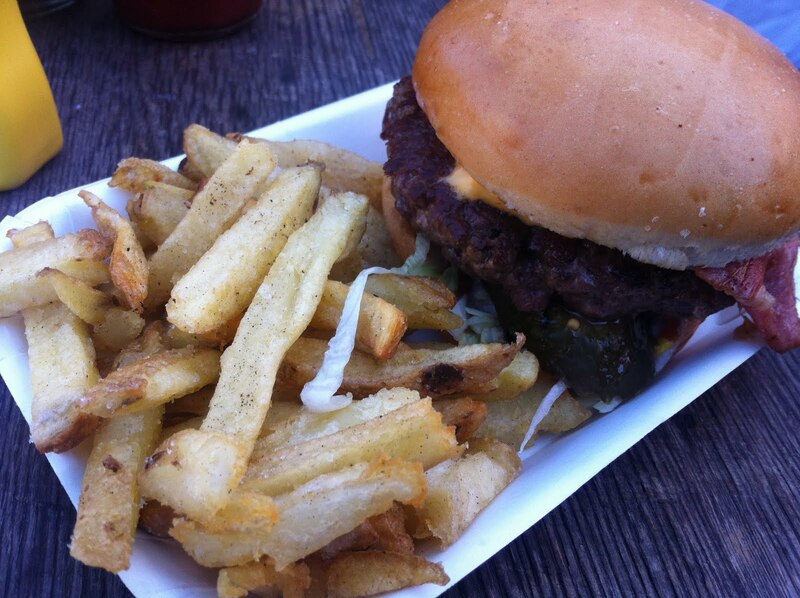 That's my only issue with the Lucky Chip bacon burger, and it's quite a fundamental one. A great big wobbly slice of soggy gammon doesn't add anything to a cheeseburger. Back bacon belongs inside white bread soaked in brown sauce, and you use crispy streaky bacon for burgers - everyone knows that. I'm sure their applewood smoked pig is very good quality, but finding it inside an otherwise very authentic American burger is a bit like serving a roast dinner with curly fries. It just doesn't work. 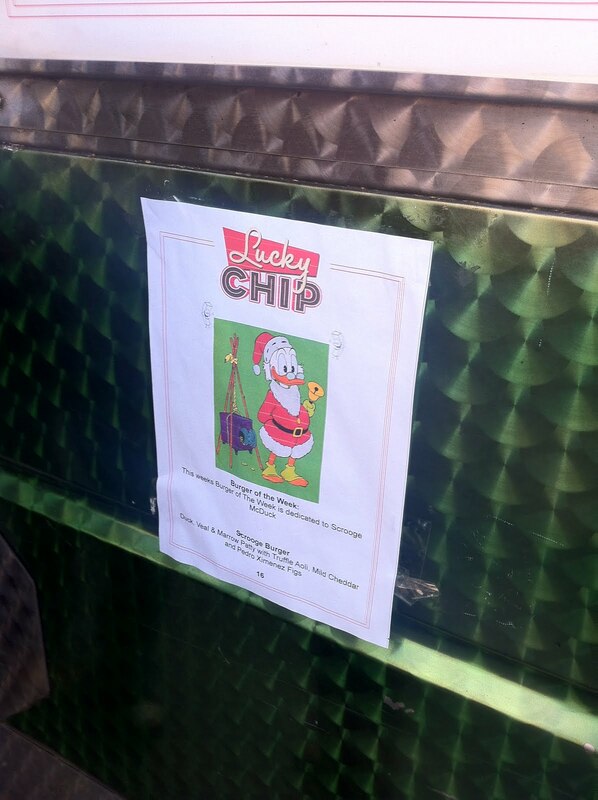 That said, the quality of the other ingredients from Lucky Chip, including their excellent fries which despite having that slightly soily taste of skin-on had a very good potatoey flavour and addictive crunch, meant this was still food that was very easy to enjoy. 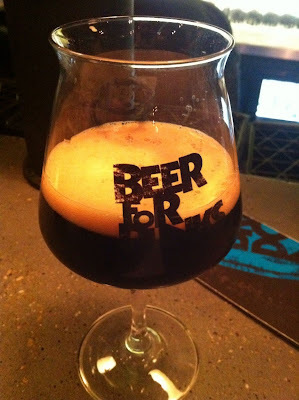 It is not, in the end, a MeatLiquor beater - that extra inch of sordid heaving decadence, power and black magic is somehow still missing (maybe it's the bacon, but it's not just the bacon) - but in this price range and in late 2011, there is very little else that can touch it. But maybe even that is changing. I began this post high-mindedly declaring I hardly ever write up press events or launch nights, but based on a very hastily arranged sample of Masterchef winner Tim Anderson's burgers at brand-spanking-new Brewdog Bar in Camden last week, London looks like suddenly being something approaching spoiled in this arena. He had made one containing an interesting mix of Bangladeshi spices, which wasn't anywhere near as weird as it sounds, but of course my favourite was the standard cheeseburger, juicy loose beef, sliced pickles, American cheese, nice soft brioche bun. Oh, and the bar serves almost the complete range of the best craft beers in the world, including my beloved Tokyo on draft. Things are looking up. Had I done a bit more research, taken a bit more advice, even gone to the effort of checking their website, I would have known to avoid Bukowski like the plague. Everything about the place seems designed to irritate, from the wilfully quirky way they describe themselves ("We are a new-school fast slow-food American diner", sod off) to the exhausting list of worthy suppliers and liberal use of hipster foodie buzzwords like "single estate organic heritage" (tomatoes) and "artisinal[sic] wood oven" (bread). It seems obvious now, looking back, that this is an outlet that values how they look on paper (and specifically the calculatedly rustic paper they print their overblown menus on) above anything that comes out of their kitchens, but on Sunday afternoon I was in the mood for a burger (shocking but true) and thought I could do worse than mooch around the new Boxpark shopping centre in Shoreditch. 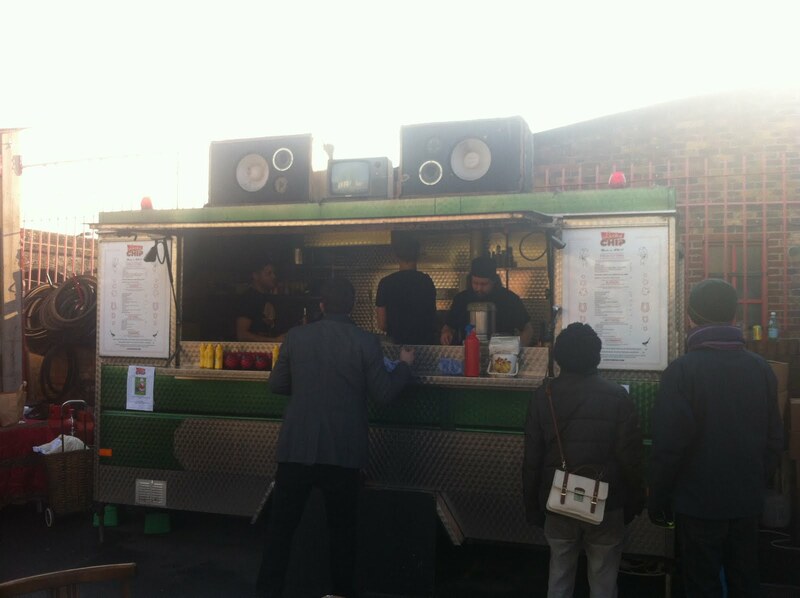 Boxpark is a restaurant and retail space based inside converted shipping containers. If you're thinking that sounds a bit odd, then you're not wrong - the only units that seemed like a comfortable size were those where two had been knocked through into one; most single-container shops had barely enough room to shuffle through single-file, and perhaps understandably the food side of things tended to lean heavily towards a lunchy takeaway theme - Pieminister were there, as were dull rabbit food-peddlers Chop'd. Bukowski itself only has seats inside for a maximum of 16 people; presumably all the retailers are looking forward to spring where the large outdoor seating areas will be of slightly more use, although I do wonder how the already massively inadequate toilet facilities (just some portaloos behind a code-locked door) will cope. I guess Pizza East is only over the road if you want to use theirs, you certainly wouldn't want to visit for any other reason. Everything you need to know about the food at Bukowski is summed up in the fact that they shun Heinz tomato ketchup for their own homemade lumpy, watery "organic heritage tomato ketchup made from single estate organic San Marzano tomatoes". Heinz tastes better, is cheaper and is good enough for every other restaurant in town but no, why settle for that when you have a golden opportunity to bugger something up? I glumly worked my way through the rest of the wordy menu whilst sipping on a watery Bloody Mary in a plastic cup containing bitter chunks of raw horseradish. I guess it was only a fiver but it didn't taste like it had more than a single shot of vodka in it and still wasn't worth the effort. I'm not going to dwell too long on everything that was wrong with the Bukowski bacon cheese burger - there aren't enough hours in the day - but briefly, the David Tomlin Rare Breed Survival Trust Hereford Steer beef was overcooked to grey (we'd ordered medium-rare) and tasted of nothing, the Greens of Glastonbury Organic Aged Double Gloucester cheese was completely inappropriate for a burger (I know it's not to everyone's taste apart from geeky burger purists like me but at least give me the option of American Yellow), the Topolski of Kruszewo naturally fermented gherkins would have been better served sliced inside the burger than slowly drying out on the side, and all the ingredients were fighting a losing battle against the overwhelmingly powerful smoked Gloucester Old Spot streaky bacon, which was the only thing that really had any flavour. Oh, and the Bridget Hugo's "Bread Bread" artisinal[sic] wood oven bakery buns had quite a nice soft sweet taste but weren't strong enough and fell apart after a few bites. Bukowksi are equally adept at royally cocking up other American classics too, though. A pulled pork sandwich contained bland, dry meat and was no better than the version I'd had from Barbecoa, and that was bad enough. House fries - sorry, "Hand cut Heritage Organic chips" were greasy, a strange orange colour (strangely, my iPhone seems to have made them look more normal than they actually were) and absolutely covered in salt although actually when you found one that wasn't too soggy it tasted OK. We briefly tried dipping them into the Scotch Bonnet relish ("Very HOT - Use with caution!") which wasn't that hot and didn't taste of anything much more than blitzed pepper, but very soon lost interest. You may be thinking that a mediocre lunch for around £15 is not something worth spending too much time fretting about. Ordinarily I'd agree with you, too - this is still not the worst burger in London and at least it's not another branch of some tepid high street chain. But what worries me about Bukowski is the sheer amount of energy and (presumably) expense that has been lavished on finding oh-so-impressive sounding "local" and "artisan" producers without any trace of that effort being reflected in the actual finished product. So keen are they to tout their earnestly foodie credentials that the menu is almost a parody of itself; reams of text describe every item on the menu in such mind-numbing detail you wonder whether you should be ordering off it or submitting it for peer review. And yet despite - or even perhaps because of - all that self-important bluster and showmanship, the food was terribly ordinary. I think it all goes back to the issue with the 'home made' ketchup. It takes a very specific kind of mind-set to conclude that Heinz not only can be improved upon, but that the way to do that is to blitz up some "heritage" (whatever the hell that even means) tomatoes with a fancy name and put it in a swing stopper bottle. Anyone, literally anyone, and I'm including whoever's in charge of the food at Bukowski here, would prefer Heinz to this bland alternative and yet there it is anyway, an expensive and pretentious waste of time and energy. 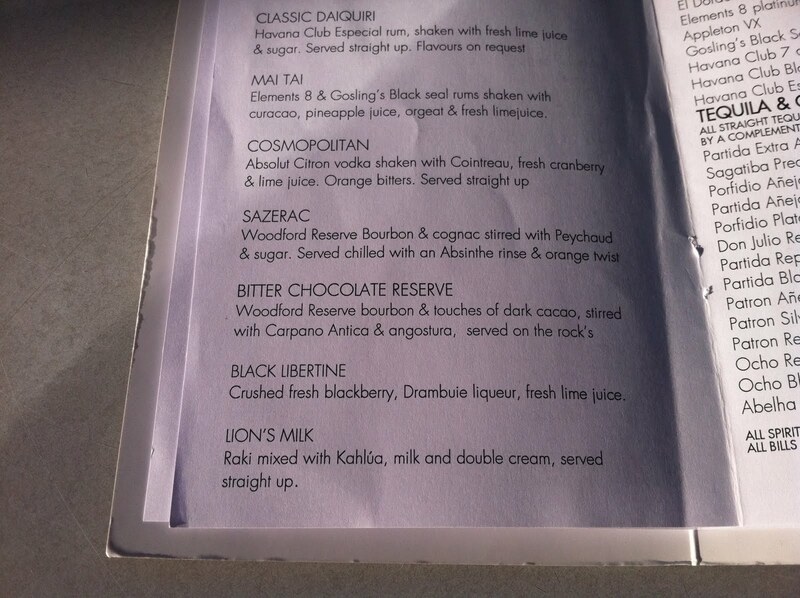 That Bukowski have gone down this route at all suggests they care far more about having correctly on-trend words on their menu than making good food - even the name 'Bukowski' looks like an attempt to curry favour with local hipster intellectuals - and that saddens me. Save yourself the disappointment and the irritation, and spend your money elsewhere. As much as I flatter myself that there is such a thing as an objectively good restaurant, I've had enough people going for a meal out on the back of one of my more slavering posts, only to hate it, to demonstrate that nothing could be further from the truth. Yes, some good places can have occasional off-days while some bad ones have very occasional "ons", but I'm not just talking about the perils of recommending an inconsistent kitchen. The single most important factor that governs whether you will enjoy a meal out has always been, and always will be, personal preference. Don't like queuing and table-turning? You won't like Tayyabs. Don't like eating in the dark? Avoid MeatLiquor. Can't bear the idea of spending £100 on lunch? The Ledbury's not for you. And it doesn't matter how much I try and convince you that all these places are amongst the best ways of spending your money in London, if somewhere aggravates your intolerances or your own particular penchants and eccentricities aren't catered for, you will not have a good time, and there's nothing I or anyone else can do about it. Objectivity aside, then, Morgan M will be many, many people's idea of a good restaurant. It is smart and comfortable, serviced by effortlessly charming staff with outrageous Gallic accents and the menu boasts a comprehensive list of all the dishes you could reasonably expect to find in such a place - foie gras terrine, lobster cannelloni, tarte tatin. And it probably says far more about me than anything Morgan M are doing that I'm afraid I just found it all a bit, well, dull. Nothing was bad, some things were good, but for the best part of £60 a head with a couple of house wines, I couldn't help thinking how much further this kind of money would go elsewhere. 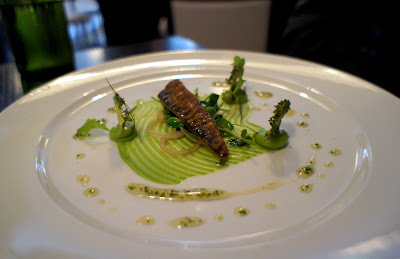 Call me fussy (and you may be right), but perhaps competent French haute cuisine doesn't rock my boat as it so clearly does for so many others. 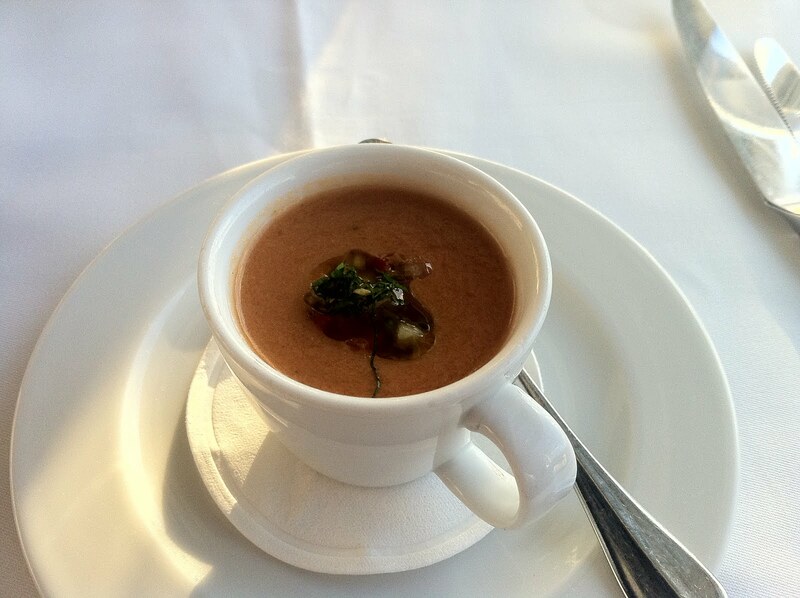 An amuse of beetroot soup, containing a sharp sorbet and a little blob of horseradish cream, was good, doing its palate-freshening job very well and with top seasonal awareness. I imagine you're all getting sick of hearing me say this, but apologies once again for the photos - it all looked a lot better than my iPhone would have you believe. The best thing you can say about my snail ravioli starter was that you could really taste the snails - they were either better quality than most I've had in the past or Morgan M's treatment of them was spot-on. The pasta was delicate and silky, containing dainty chunks of vegetables in amongst the snail meat, and the Chablis they were poached in gave a pleasant alcoholic tang. In fact, thinking back now I have no idea why I didn't like it more - perhaps the "garlic froth" was too insubstantial to lend any depth (ironic accusing a froth of being insubstantial) or perhaps it was just missing that something extra to quite justify the £12.50 price tag. A friend's foie gras terrine was similarly competent, the foie slightly fridge-fresh and the brioche a bit dry, but nothing too disastrous. £14, mind. As with the starters, there was much to admire about the mains, yet little to love. 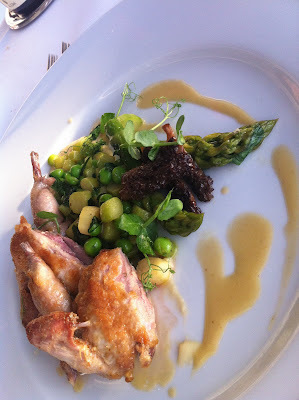 Best of the two was a partridge, carefully butchered and presented with a roast breast underneath a boned leg & thigh. At least when you pay your £21.50 for game in a French restaurant you do get your money's worth in the often painstaking preparation. This came with a pleasant liver and bread sauce arrangement in tribute to a traditional game dinner, and a rather less traditional but no less tasty caramelised chicory. 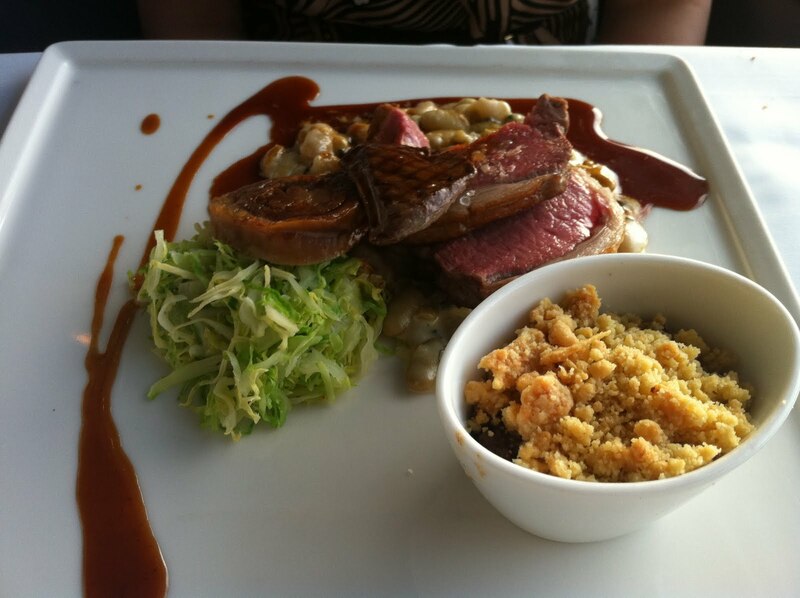 My mallard though, despite on paper having everything going for it, was let down by strangely tasteless meat. The breast wasn't overcooked, I'd have liked a bit more crispiness in the skin and the confit leg was a little dry, but even if prepared absolutely perfectly I doubt this would have been worth the effort. I also could have done without the three dense, chalky nuggets of old chestnut (yes, that old chestnut). Events nearly came full swing with the appearance of a brilliant cheeseboard, and in particular a wonderful (and stinky) Livarot. That's it there, second on the left, looking innocent enough through the gloom of my photography but believe me, if there was such a thing as food blog smell-o-vision you'd have environmental health officers knocking on your door. Pre-dessert of rice pudding with winter berries was good, and a refreshing change to just have a mouthful of rice pudding without having to wade your way through an entire bowl. I feel the same way about rice pudding as I do about risotto - less is more. Finally, a decent pineapple soufflé which while slightly on the eggy and greasy side still had plenty of flavour and came with a blob of pineapple coconut ice cream which was a bit like eating a piña colada. Which isn't a bad thing, by any means. To reiterate my earlier point, that eating out is a deeply subjective experience is perfectly illustrated in the fact that Morgan M already is a success - this Barbican branch is an offshoot of the original site in Islington, which presumably has been doing such a roaring trade they've found themselves in the position where they are able to expand. And good luck to them, too - God knows I'd rather see a proliferation of solid French restaurants, even Michelin-chasing ones, than yet another bloody Cafe Rouge. It's staid and stuffy and anachronistic but these are my particular bugbears and not necessarily anyone else's, and I'm sure they will find just as many fans in EC1 as in N7. I'm not one of them, of course, but then what good would it be if we were all the same? 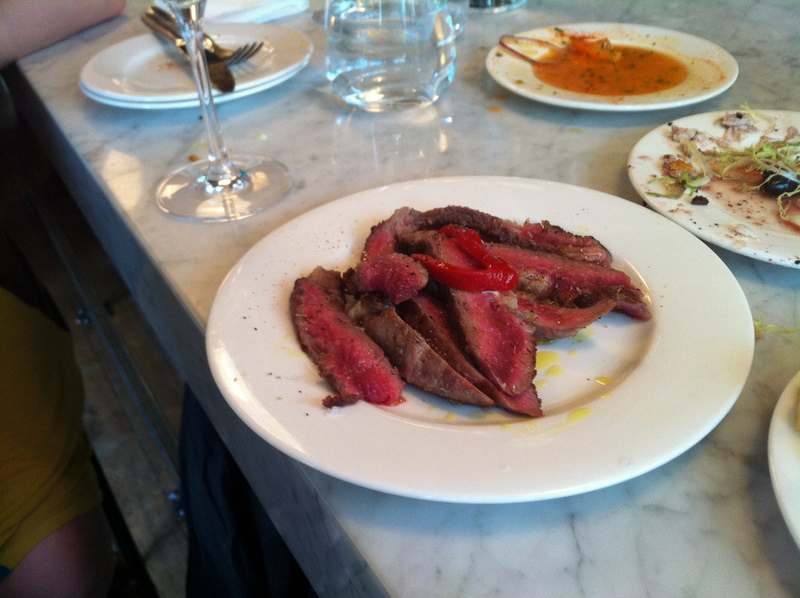 One of the few criticisms of José Pizarro's tapas bar in Bermondsey - in fact really the only criticism - is that it's always far too busy. In Madrid, a place like José would be one of a number of options to pop in and enjoy a glass of sherry and some carved ham in any given area of town, and whilst some would be better than others, the idea is that you spend a happy evening going from bar to bar, never lingering too long in one spot and with the sheer number of alternatives helping to thin out the crowds. 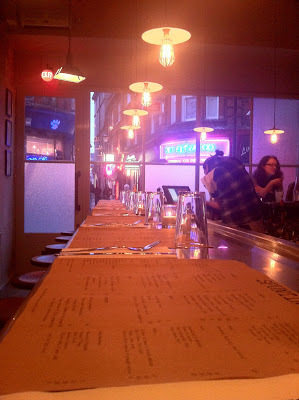 No such luck in SE1 - the nearest decent tapas bar once you've done with José is a cab ride to Soho away, and so the only option is to queue, cheek to jowl with other hungry patrons, hoping at some point you'll be lucky and find a seat. It's worth it, because the food and drink is always so brilliant, but you can see why it's not for everyone. What José needs, and what the people of London need, is competition - and unless you manage to get a walk-in at Zucca (good luck with that), there ain't none. 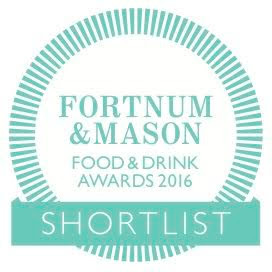 I am worried a very similar fate will befall Soif, the new restaurant from the guys behind the Terroirs and Brawn. There are lots and lots of restaurants in Battersea but with the odd exception they are all absolutely crap, so anywhere that is any good (Mien Tay, the Draft House) is permanently hugely oversubscribed. And Soif is just so much better than anywhere else in this part of town that I can very soon see it turning into the Zucca of SW11 - booked up six months in advance and with a waiting list like a kidney transplant. For now, though, let's enjoy it before the word gets around and you still stand a snowball's chance in hell of eating there. Lardo di Colonnata, buttery and rich and presented on a marble tray in thin ribbons, was very tasty although when I've had lardo before it's been simply dressed with olive oil and seasoning and I think that helps lighten it slightly. Having said that though, it still all disappeared very quickly and if you don't enjoy the experience of melting bright write strips of pig fat in your mouth and washing them down with the house red there's something seriously wrong with you. All the food from here on was, without exception, superb. A bowl of clams in butter and garlic was superficially simple but one of those things that's far too easy to get wrong. Bursting with freshness and seasoned perfectly, the only thing better than sucking back the sweet, juicy bivalves themselves was dipping the house sourdough in the garlicky butter sauce left behind - just brilliant. This cute little pile of surf and turf is a paprika (I think) studded squid balanced on a disc of thick black pudding. The squid had a great flavour and a nice soft texture but the real star here was the black pudding, so thick and powerfully flavoured it was like a solid slow-cooked stew studded with chunks of pork fat. And the third of the starters, chanterelles and pancetta, very like something I'd had once at Brawn, was a posh - and perfect - mushrooms on toast, with all kinds of strange shapes combining into an addictive mix of crunchy and soft, sweet and salty. Based on the number of times I've had a dry partridge with flabby skin, it can't be easy to cook these birds properly. But this example was great - roasted golden brown with a fantastic aroma, the flesh beneath the crust was soft and juicy and full of gamey flavour. The sauerkraut (sorry, "choucroute"), despite my initial reservations, actually made a good sharp counterpoint to the meat, and the combination was all the more impressive once the juices from the bird had begun to mix together. But I still remain to be convinced whether it really did need that huge piece of Montbéliard sausage - it tasted perfectly nice but after stripping the partridge to the bone and knocking back a couple of mouthfuls of sauerkraut I barely had space to really appreciate it. Perhaps those with a bigger appetite would disagree. There was one other main I forgot to take a picture of - a bowl of pig cheeks in cider and winter veg, but it was of a similar standard to the rest of the food - as soft as Christmas cake, rich as foie gras, comforting as a thick porky blanket. And given how much of my main course I had to leave, I'm not sure how I found room for any chestnut cake, but one slice between three people was just enough to send us wobbling on our way - it was lovely though, soft and buttery and lifted by the accompanying crème fraiche. The bill, with a 500ml carafe of Cuvee Briand (much of the inspiration for the wine list and the food at Soif apparently comes from the Ardeche in SE France) came to £40 a head, which I suppose isn't super cheap but thanks to the generous attitude to portion sizes we were absolutely stuffed and you can hardly claim for food of this standard that it wasn't good value. Anywhere in London, Soif would be a great restaurant but given the standards of the area it's little short of miraculous. And it's for this reason that my hearty recommendation on 2nd December 2011 comes with a potentially ruinous caveat - this is a great value restaurant serving top food and wines in pleasant surroundings, but it's in Battersea, so be warned: I can guarantee that whenever you decide to try your luck, you won't be the only Nando's or Pizza Express exile on the hunt for a some decent grub. 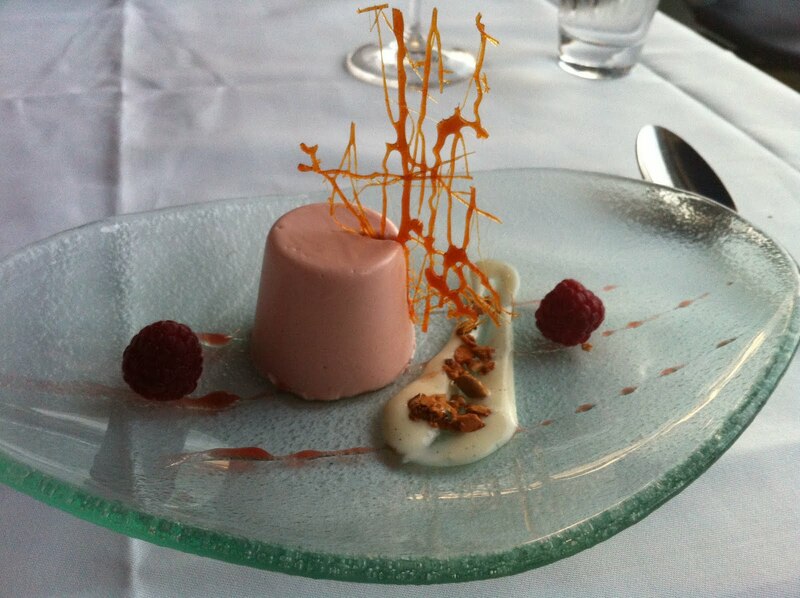 Nothing was quite right about our meal at the Oxo Tower restaurant. But before you settle down for a long and satisfying dose of schadenfreude, I should also say that nothing was that bad about it either. Everything, from the decor to the service to drinks and (most importantly) the food weaved a fine line between disappointing and just about acceptable, never dropping below the former and rarely rising above the latter, and so I can neither wholeheartedly recommend it or condemn it. It's a frustrating place, wowing you with superficial glamour while never quite satisfying on any other level. Take that view, for example. 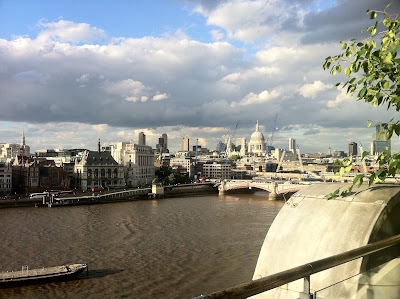 The Oxo Tower is on the 8th floor of a building right on the south bank of the river Thames and is blessed with one of the most fantastic vistas in the city, a grand, sweeping panorama encompassing St Paul's cathedral all the way round to the Savoy hotel. Quite understandably the staff are keen to show it off, and we were offered a seat on the terrace accompanied by cocktails and nibbles. But while I should have been enjoying the view I couldn't help being distracted by the scruffy old uncomfortable chairs, the weird Astroturf on the floor which made me feel like I was sitting in a B&Q garden furniture display, and the regular misuse of apostrophes in the cocktail menu. Also, am I wrong to expect a lychee and rose petal martini to be pink or at least be garnished with rose petals? It tasted OK (and was "only" £10, actually a pretty good price for a cocktail these days) but again, there was just that overwhelming sense of "not quite". 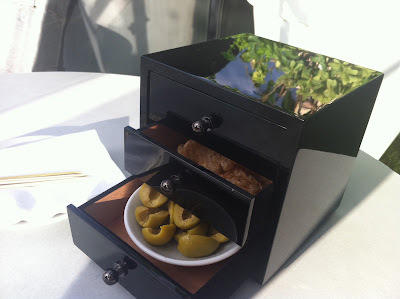 The nibbles were pretty interesting though, a fancy black box with drawers containing olives, home made (and very good) pork scratchings and some delicate potato crisps. Once reseated inside, the general sense of discomfort only continued. 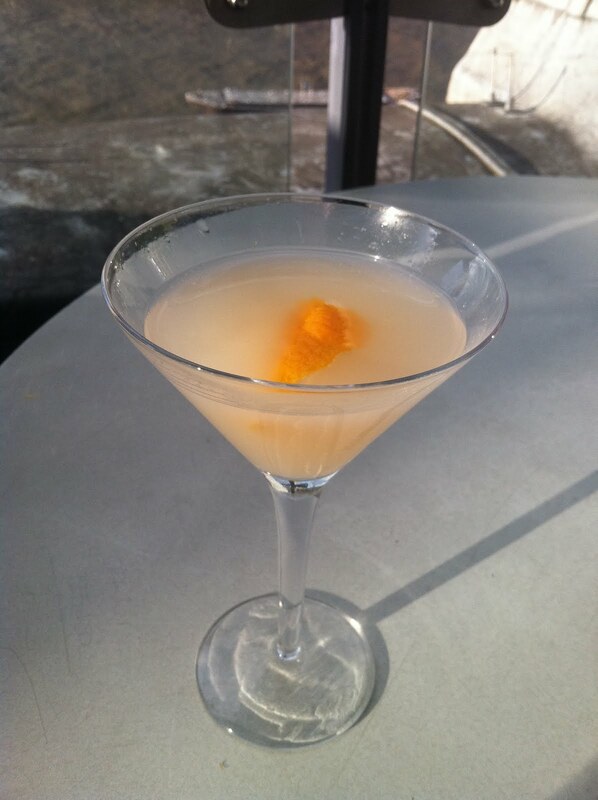 So keen are Oxo Tower to show off their fantastic view that there is absolutely no guard against the early summer sun, and anyone unlucky enough to be seated facing west had to squint at their date and the table in front of them until sundown. And yet, eating with one hand and using the other as a visor, an amuse of gaspacho was genuinely lovely, well seasoned and with nice fresh vegetable flavour. Perhaps the food would be worth it after all. A quail starter was nearly right. Clearly a lot of work had gone into boning the teeny leg and breast portions, and the selection of summer vegetables was cooked perfectly and very pretty. But the bird itself was soggy, smelling rather more of the oil it was cooked in than of nice fresh poultry; it seemed they had sacrificed a nice browned skin and crispy texture for tender moist flesh with slower cooking. Which is a bit of a shame. 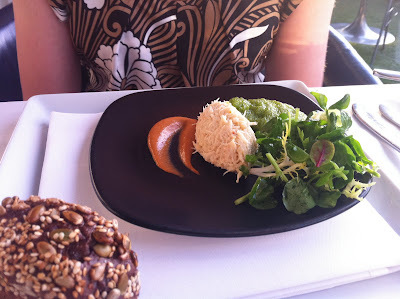 In a similar vein, a crab starter was fairly underwhelming, just a blob of fresh crab meat and salad, although an accompanying mini rye loaf was very good indeed, as was the selection of house breads. Whoever's in charge of baking at Oxo Tower knows what they're doing. Mains were more disappointing still. Despite being told the lamb came medium rare, it was overcooked and chewy, didn't have a great deal of flavour and was rather a chore to eat, although the accompanying cheese "crumble" (kind of a mini cottage pie) was - bizarrely - gorgeous. And I don't know what they'd done to my lemon sole, but this usually robust and flavoursome fish was bland and mushy, in dire need of seasoning - or something - to lift it, and the collection of insipid vegetables and froth beneath tasted like pond water. 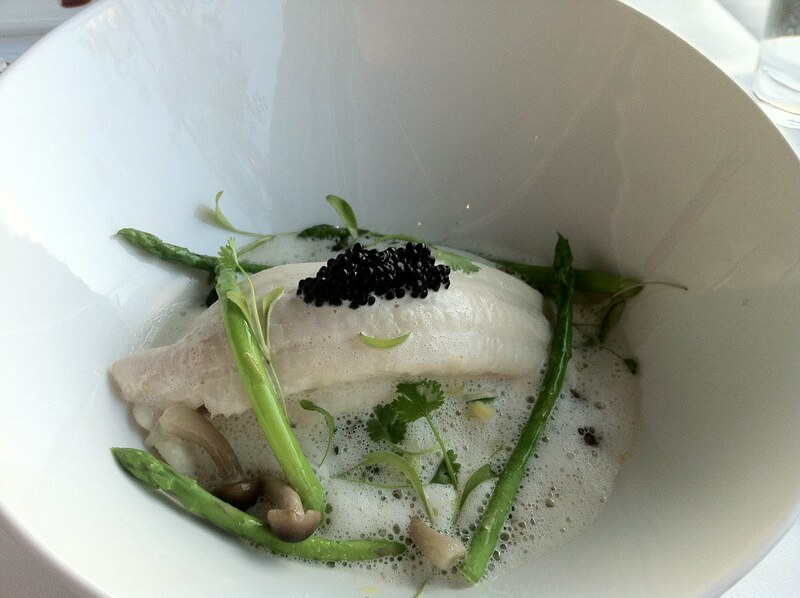 Even the "caviar" on top was muted, with hardly any flavour at all. Although we skipped dessert, they were nice enough to bring what would otherwise have been the complimentary pre-dessert of raspberry panacotta. It was nice enough, but certainly nothing interesting enough to make us wish we'd gone for a full extra course. 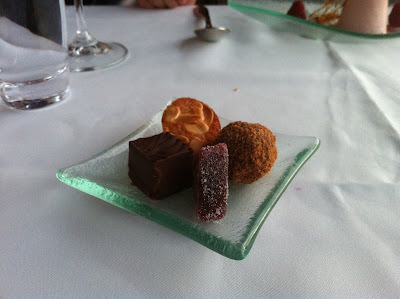 Same goes for the petits fours. The bill for two came to £141. We had ordered a £36 bottle of Beaujolais and a £4.50 side of French beans, but that total doesn't include the cocktails (which they strangely didn't charge us for); as I say, none of it was technically inedible but I think I am entitled to expect a little more dazzle from a meal that sits alongside places like the ever-reliable Galvin @ Windows in this price category and style of cuisine. And Galvin can even beat them on the view. For somewhere that asks so much of your wallet, the Oxo Tower never gives enough back to represent value for money, and value for money is really what it's all about. The restaurant was at capacity last night - clearly there are enough people who think "never mind the food, what about the view", but I'm afraid I'm not one of them. And I can't see myself returning.